Fri., Jun 7 - Spring Show - "Under the Sea"
Cape Cod Gymnastics received Readers Choice Gold! for Cape Cod Dance and Gymnastics Schools. To encourage and provide any child a beginning in athletics and start them on the road to a healthy and fit future. 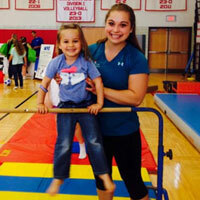 At Cape Cod Gymnastics, every child is a champion! Take a look at some of the gymnastics classes we offer. Check out this great article on why all boys should do gymnastics...even if they don't want to be gymnasts!